I started by punching 5 stars from blue cardstock, using Recollections' 15/16" star punch. I used Chipped Sapphire Distress ink to stamp my greeting, from this Hero Arts Stamp set, onto white cardstock, and clear heat embossed it. I die cut that and 5 other circles with a Spellbinders Classic Circles die. For the red circle mats, I didn't have a die just the right size to have an 1/8" mat. So I traced around the outside of the same die 6 times, then cut them out with scissors. To do the stenciled panel, I taped down the "Mini Star Fall" stencil by The Crafter's Workshop over a piece of white cardstock cut to the size in the sketch. I blended Chipped Sapphire over the stars using my mini ink blending tool. All that was left to do was assemble the card. I adhered a piece of light blue cardstock to an A2 card base, then adhered my stenciled star panel over that. I glued down the red circles, and glued the white circles and stars in place on those. Finally I glued down the red strip along the left side, and the card was finished. Simon Says Stamp's Monday "Anything Goes"
Great card, I know that someone at OWH is really going to appreciate it. Thanks for joining us for this week's Simon Says Stamp Monday Challenge! Very nice job on this card. I really like the stenciling. Fun card that one of our heroes will love to send home. Enjoy your day. Super cute card! The stars are so fun! Thanks so much for playing along with us over at Simon Says Stamp! Such a great design, and I love that you chose a patriotic color combo! Thanks so much for playing along in the a2z Challenge...good luck to you! What a fabulous take on the OWH Sketch Card! 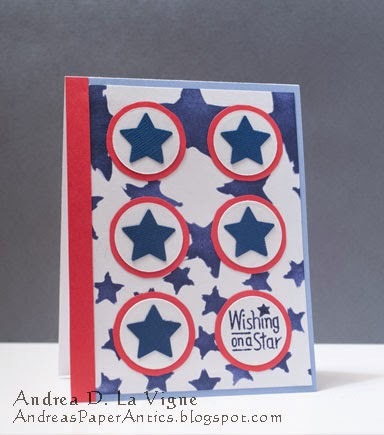 I'm also so happy that Barb invited you to enter your card to the A2Z Linky Party -- It's Perfect for the Stars and Stripes Challenge!! Thanks for playing and Good Luck! Please stop by anytime and come back on July 1st for a new "Party" and to find out if YOU won! !